An auspicious start to 2014 for Maharaj indeed! One cannot help but marvel at the power of collective prayer. May Mother continue to bless and work through Maharaj! Happy to receive your kind words on my recovery. Indeed, I believe in collective prayer. In Ranchi where I was from 1995 to 2007, I have personally seen the force of collective prayer in remedying the ‘bad’ situations of our devotees. Swamiji need not thank anybody. On the other hand, we should thank the Holy Trio for protecting our Swamiji. We are happy that our prayers have been answered. We are glad that Swamiji has completed 3 months rest. We pray to Him that He takes care of his health and has medicines on time regularly. Yes, I have by now, become well acquainted with those medically approved ‘restrictions’ and am comfortable with them. It is our good fortune to have you back hale and hearty. Thank you and Raja for making a visit, albeit too short, with your son Krishnan to our Durban Ashram to meet me. I was glad that you could make it in spite of the extremely busy schedule you had. The devotees from SA who accompanied me to Gaborone during my last visit and who were treated by you with grand hospitality were indeed disappointed in not able to reciprocate! Next time please keep at least five days for Durban visit. Maharaj your love for the devotees and your openness and availability to us all has endeared you to us by more than a cyber connection! I am grateful that the prayers helped but more importantly I feel that this is all the fruit of your love and grace to us and devotion to Master. If at all any devotee has felt blessed by my love and affection, its all due to His grace alone. As humans we are incapable of doing so seized with natural human foibles, unless by His grace the divine perception of the world around us is aroused. Oh Yes! I implicitly obey the doctor’s orders. Do you know that there is a Sanskrit proverb that says “vaidyo naaraayana harihi” – “the healer is verily Lord Narayana”. I have by now, become well acquainted with those medically approved ‘restrictions’ and am comfortable with them. So please be rest assured that I shall continue to follow. I am indeed proud of you that you, as one of the two candidates, have been selected by our HQ Belur Math to deliver your Presentation in the Youth Seminar of the grand Concluding Ceremony of Swamiji’s 150th birth anniversary in a few days distance. Bon voyage! May your journey bring you fulfillment! Indeed an excellent start to the New Year! Our minds would be constantly raised by Maharajji’s brilliant talks and simply by being in Maharajji’s presence. We seriously missed that! I totally agree with Dr Shivani Singh that Maharaj should now be very careful with diet and programs. Our humble pranam to Holy Trio for giving Maharajji the strength to overcome the ordeal so rapidly. Well, the mental elevation that the audience experiences is not a one-way traffic! Normally, the speaker’s brilliant ideas alone cannot make the elevation possible. It requires the part of the audience too to be ‘at readiness’ in receiving those thoughts. When collectively positive vibrations are created vis-à-vis, the atmosphere becomes surcharged where every one can feel it palpably. If you had missed, I too! Hope you are feeling well now and recovering speedily. Please follow your physician’s advice which I am sure you will. Indeed there is much power in thought and prayer. Thanks to the Holy Trio for granting endurance and speedy recovery of Maharaj. May the gift of Master’s peace, joy and good health always be by your side. Happy to receive your kind words on my recovery. Thank you! Did you hear that Swami Nirmalatmanandaji, Head of our Brazil Ashram centre will be in Cape Town from 7th to 10th. Hope you would be able to meet him. For details please contact Robbie at his cell: 0793099776. We are so glad to hear the first discourse with the same voice, same energy on the 22nd Dec and again on the 01 January 2014. We are drawing energy from you that sometime we feel guilty of taking too much energy from you or not. Because of Holy Trio, we are fortunate to get you back. You have changed lots of people’s lives just by giving sincere love to all. We will keep on praying for your good health so that we can continue with spiritual growth. Now we are looking forward to your Gospel class in PMB. Yes, I have started taking classes, the first after three months intermission, a 5-hour-5-day Course on Isha Upanishad from 16th to 20th December 2013. Then on 22nd we had Vedanta Retreat where I had, by His grace, delivered a Talk on “Journey thru’ 3 states of Consciousness”. It was a sort of experimentation to find out whether I was physically fit or not. Fortunately I didn’t feel any sort of discomfort. The weekly Gita classes are scheduled to begin from 21st January, 2014. Yet I am not accepting outside invitations for discourses etc as it entails travelling. I am going slow…! PMB Gospel class may start from the month of April, I suppose! I am very happy about the good news of your health. My sincere prayer for the New Year to see you in good health for all the years to come. I had planned to visit US in connection with the 150th birth anniversary of Swamiji in Chicago. But Master willed it otherwise this time. Hope to meet you in the future! Indeed the Grace of The Holy Trio has manifested itself into care and treatment that you received in the hospital. We all have witnessed a Divinity in your recovery. Pranam to you on the onset of a New Year and best wishes for to our New invigorated beloved Saint that dwells within you. I still have nostalgic memories of my last visit to Haldia and the sceneries that you and your family showed me around. And the radar in the control room was wonderful. Why I remember that event is because it helped me to understand the working of our minds too – how to intercept the unwanted and dangerous thoughts and trace their origin and wipe out smoothly! I am elated for your recalling your visit to Haldia so meticulously. By the way Maharajji, I have a some piece of news that I wish to share with you. I have emailed to you with details of the sad demise of my father-in-law, Ranjit Sinha at Ranchi on 20th last. He was cremated at the Mahashoshan at Kashipur, Kolkata… Swami Vaghishanandaji Maharaj stood through the entire cremation process which lasted for four hours in the afternoon of 21st December’13. Indeed thank you very much for sharing the news of late Ranjit babu. I received a detailed mail too from his daughter Shibani explaining the circumstances of the last day of his demise. That induced me to pen a post sharing my thoughts on him. It was with a heavy heart that I wrote. Hope you had seen it. Late Ranjit babu had interacted with many monks who are disciples of his Gurudev. I am merely one of them. But he used to treat me as the only one! The inter-relation of a devotee and a monk is spiritual in nature. Guru is the connecting thread. Nothing more to say. I am sure Mother has taken care of him. We are so happy to learn about your well being. Since I already underwent triple vessel-by pass surgery in 2007, I know restrictions you need to maintain now. So we will be more happy to see you following the advices of your physician. Happy to hear from Hazaribag, a place which Swami Vivekananda had a great fascination. How is Revered Maharaj at the School? Any forward progress for the ashram’s affiliation to Belur Math? We are so happy to learn that you are now comfortable with the post-CABG restrictions. Hope with the blessings of Sri Thakur, Sri Ma and Swamiji you will keep good health. Our Swami Tapananda Maharaj ji is fine with several ailments which a normal human being like us can not withstand. He is gradually giving shape to Swamiji’s dream for Hazaribag. The B.Ed. college entered its third year. Thanks for the news about Revered Tapanandaji Maharaj. His zeal, enthusiasm and efforts have become legendary. Happy that BEd College is growing. Please convey my pranam to him. Swami Vimokshananda has been rendering great service to the society over many years and GOD has been guiding him every moment. His Grace Will ensure a perfect health to Swamiji. My Pranam to the doctors and their team for the care and the well-wishers for their prayers. 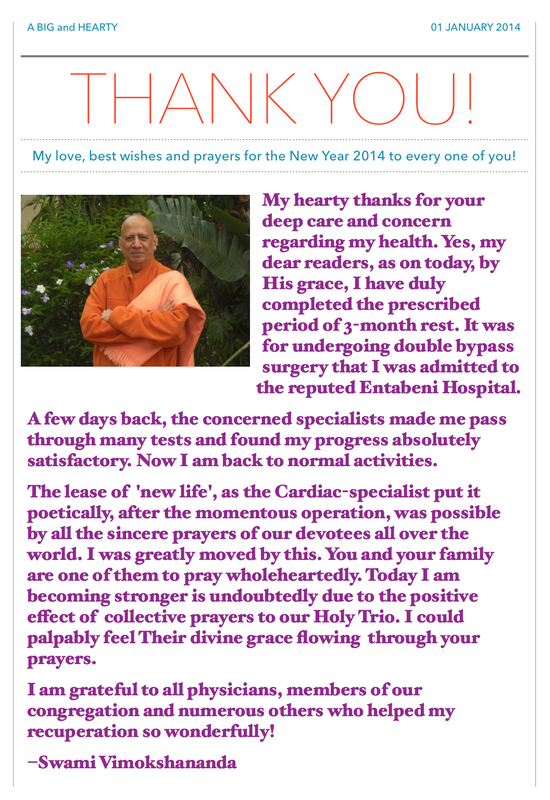 I and my family pray for Swamiji’s total recovery and back to service of people in SA. Thanks for your first visit to this blog! And also for your kind words. It is wonderful to think of so many well-wishers from different strata of society coming in aid of my speedy recovery. Yes, you are my old friend from our school days. Your wishes are indeed valuable to me. That is very pleasing to hear!!! May Master, Mother and Swamiji keep on blessing you and pray that your challenges are always removed! Thank you for the guidance you always give and pray that our spirituality soars! I too am pleased to meet all devotees again through the ashram’s festivals and classes. My prayer always goes for the spiritual upliftment of devotees who are so wonderful in this country. We are really glad to receive the news of your recovery. Hope, with the blessings of Thakur, Ma and Swamiji you will be healthy in many years to come. Your spiritual advice always keeping us happy. Please take our pronam in New Year and Kalpataru day! Thanks too for your hearty prayers! We are very glad to know that your health is now well after long a treatment and observation. Still we hope that Thakur will make possible to meet with you. Like we were regularly meeting at Tupudana ashram and getting energy from you. Kindly send your contact number. Happy to hear from you after a long time. Yes, Tupudana days always will remain a nostalgia for me as here I had the occasion to meet many, many new people who later on became Sri Thakur-Ma-Swamiji’s devotees. You and Lata are one of them in taking the Holy Trio to your hearts. I too look forward to meeting you all on my next visit to our motherland. My cell number is +27 82 313 8200 though I may not be available most of the time as I do not carry the phone with me! I am so happy to hear of your good recovery by the grace of Sri Sri Thakur, Sri Sri Ma and Swamiji Maharaj. My mother also sends her pronam. Thanks too for your mother’s wishes. Please convey her my respects and love to her. Indeed your mother and late father are shining examples of being good devotees always lending their helping hands in our seva to our brothers and sisters of poverty. Very glad to hear that you are recovering after the double bypass surgery. No need to thank us. We are very grateful to Gurudev, Sarada Devi and Swami Vivekananda. We wish you Happy New Year! Myself and Mr.Mani have come to Pune. We all went to Gir forest and Somnath temple as the children are having winter vacation. We all enjoyed the forest location. From here we will be going to Chennai for Meena’s marriage. At Rajkot we went to Ramakrishna Mission also. There one Maharaj told us that he has seen you at Ranchi Mission. Please take care of your health. Please accept our Pranam! Also, glad to know about your Gujarat travel. It is indeed a great blessing to go on a pilgrimage of Somnath temple. This unique temple stands as a testimony to thousands and thousands of young Hindu soldiers and their utter determination to rebuild it after it’s desecration a number of times as found in the pages of history. Thank you for this wonderful news! We so look forward to seeing you again. Indeed so. Looking forward to meeting you and all of my students in the forthcoming Gita Class to be resumed from Tuesday, the 21st January 2014. We did not know that you were so much ill and had undergone double bypass surgery. We are relieved to know that you have recovered considerably and have started your activities again. Best wishes and prayers for your health. Is your son still in Adobe? I found a very useful online site Adobe Revel. Thank you for your reply. We are obliged to know that you do remember our son even after this long gap. No, our son, Angshuman, is not in Adobe any more. He joined Yahoo in Bangaluru in 2008. For last one year He is in Singapore working for another American company. And he is going to USA now (April, 2014) to pursue MBA degree from a reputed University. It is an one year course only. He has got married too in 2011. Our daughter-in-law is a very good girl; she has done her MBA from Chennai and is in job too. Our daughter is doing well in IBM, here, in Kolkata. Please give your blessings to them. We always remember you. Your Kind visits to our home and our visits to Dungri Ashram are always in our minds. Our interactions with you and other Maharjjees have enriched us immensely. Please take care of your health. Please accept our pranam. Please accept my pronam…It feels wonderful to connect with you after many months. I pray to Lord for sustained good health. Yes, connecting again with devotees through this medium, I too feel wonderful. As Thakur Sri Ramakrishna used to say that one hemp smoker finds delight in meeting other hemp smokers!! we are delighted to hear that you are regaining your health and will soon be fully recovered. We look forward to being in your holy presence once more. Yes, by His grace, now I am back into normal activity. From next Tuesday i.e., 21st January, Gita class will be resumed.